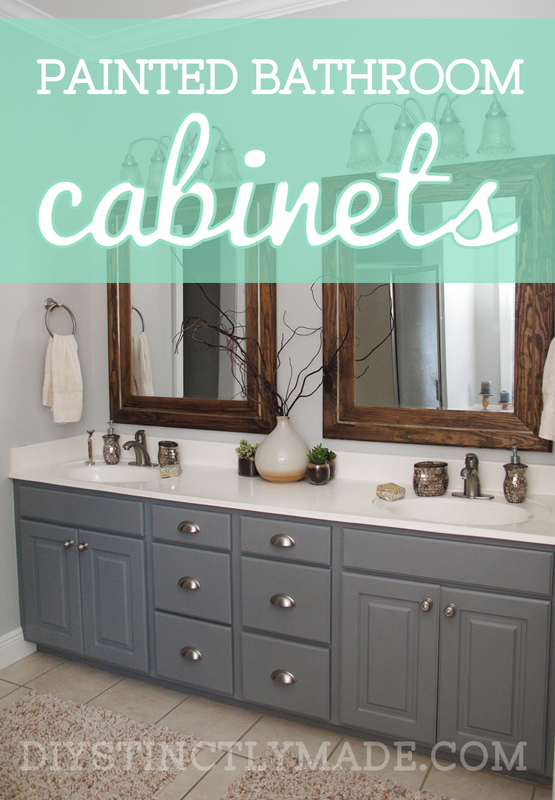 After transforming our kitchen by painting the oak cabinets, I turned my efforts towards our builder grade, fake wood master bathroom cabinets. Now, as you know, Kurt and I don’t like to spend money where it isn’t needed so I used quite a few supplies that had been purchased previously for other projects. 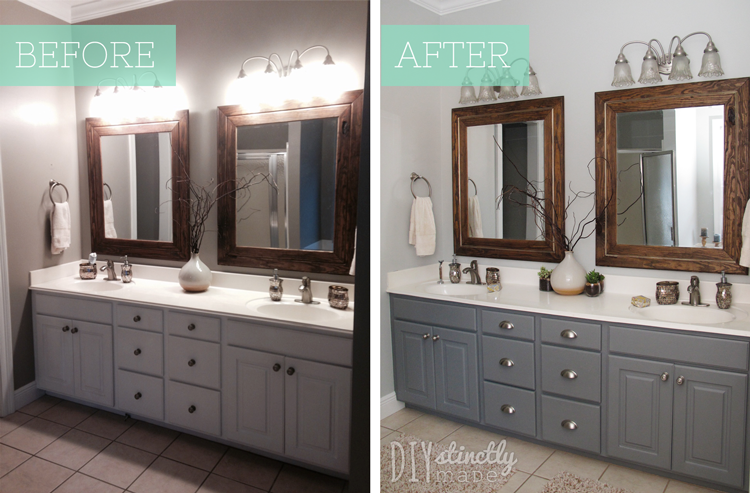 Here’s what our bathroom looked with the muddy gray walls and upgraded mirrors. To start, we took the power drill and removed all of the knobs from the drawers and cabinets doors. Next we removed the cabinet doors from the cabinets. We brought the drawers and doors outside to be sanded with the orbit sander. After using the orbit sander to sand the flats, I sanded the grooves of the doors by hand. For our kitchen cabinets we used a primer and opted out on the sanding to save time, but because we only had 10 drawers/doors in the bathroom we decided to sand them down. Also, some of the cabinets had some minor warping from moisture which was more reason to sand them. Once the drawers and doors were done, I lightly sanded the cabinet shells to rough them up before painting. After sanding was complete, we sprayed everything with Krud Kutter to prep for painting. I started by using a brush to paint the grooves of the door panels first. After the grooves of one door were painted, I grabbed the foam roller and rolled the flats of that same door. I like to do one door at a time to be sure each one is done perfectly. If you were to paint the grooves of all the doors before painting the flats, any drips or imperfections would dry before the rest of the door was painted. For the cabinets, I was able to roll the entire surface. 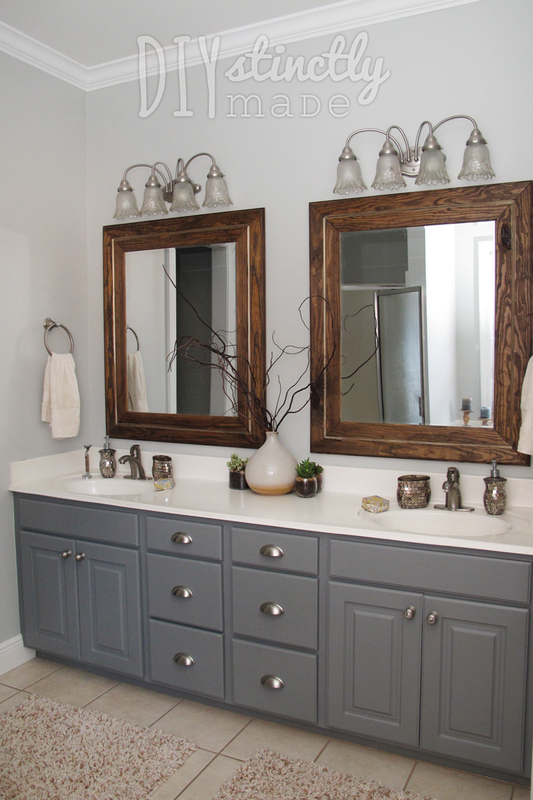 This project was a simple one so I tackled it while working on our Refinished Antique Vanity. In between coats, I headed inside and painted the first coat on the cabinets. I took the lazy route and just painted the outside… I don’t really expect anyone to be browsing through my master bathroom cabinets and judging me for not painting the inside, so I figured I could save the effort. Once everything dried, the drawers, doors, and the cabinets themselves, I lightly sanded them all and painted a second coat. What I love about using Valspar’s paint + primer is the coverage. I was able to get a nice even finish with 2 coats. After the second coat dried I applied a coat of Minwax paste wax to all pieces and buffed once they dried. I love the matte finish you get when using this wax. Its not too flat and not too shiny… just right. I wish I would have used a wax top coat instead of polyurethane for our kitchen cabinets. Oh well. You live, you learn… now we know what to do for the next house! I had purchased the cabinet cup pulls in bulk when we re-did the kitchen cabinets so I had enough to use for our bathroom. 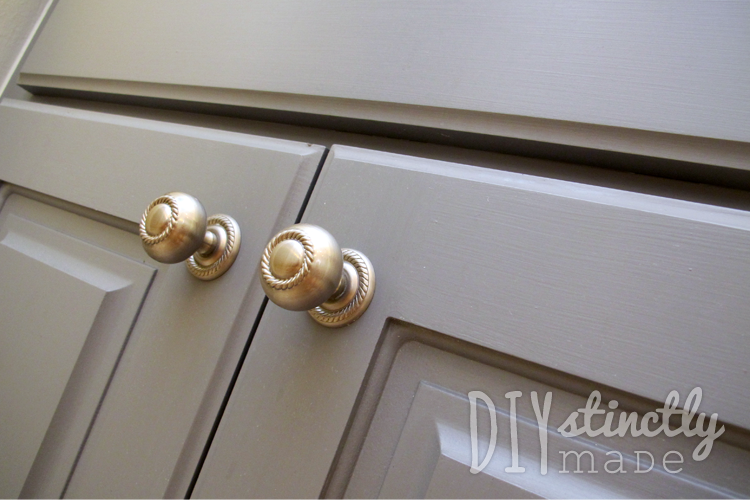 I love how the cup pulls contrast the knobs on the doors. Little details can make all the difference. 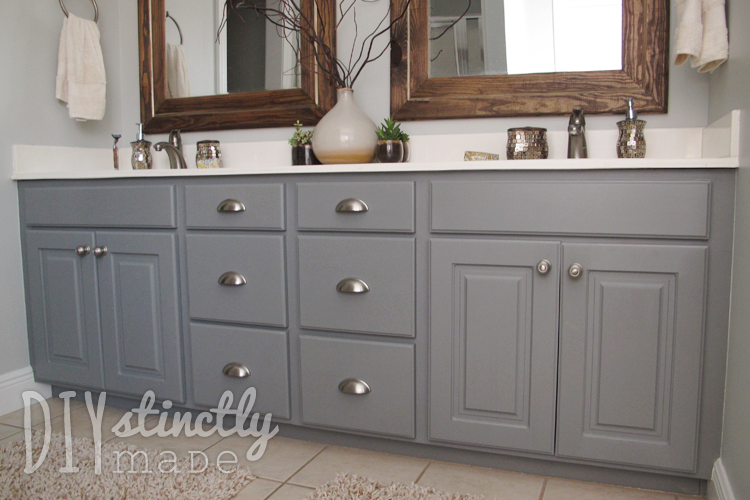 All in all we are extremely pleases with the way these easy DIYstinctlyMade cabinets have transformed our now DIYstinctlyMade master bathroom! And a couple for your pinning pleasure of course. What is the color of your bathroom walls? 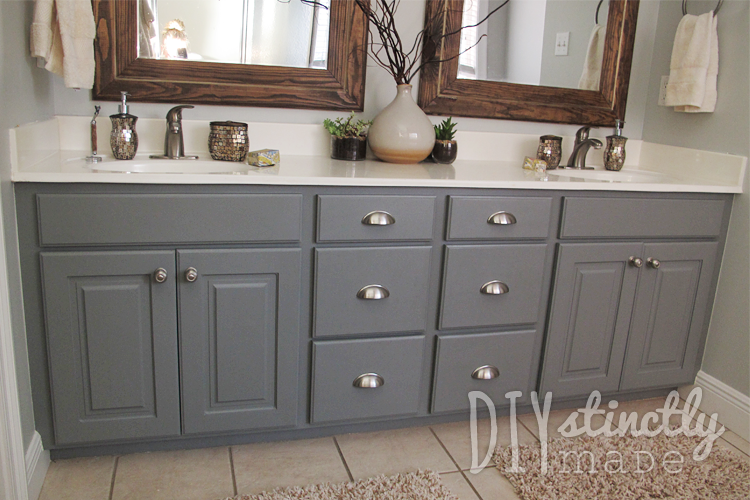 where are the cabinet knobs from? Why did you sand again after you put on the first coat of paint and before the second? Also, why do you put wax on after the second coat and where do you buy a wax like this? I always lightly sand in between coats when painting to help smooth the texture of the first coat and to give the second coat of paint something to hold on to. In the long run your finish will be more durable. I used the paste wax because I did not like the glossy finish of ployurethane on our kitchen cabinets. I use Minwax Paste Wax which can be purchased from Lowe’s or Home Depot. Your bathroom is almost identical to mine! Is your sink about 7 ft? If so- can you tell me the dimensions of those mirrors- that is EXACTLY what I’m looking for! I’m also painting my white cabinets grey- thanks for all the sanding and wax tips! Really appreciate all your thoughtful detail in your notes! Yes! Our sink is 1in over 7 ft. Each mirror is 34in x 40in. And you are very welcome! Your cabinets look so good! Question on the paste wax…do you find Tha water leaves spots on it? How’s it been holding up? I have a bathroom project where I’m contemplating using paste wax so would like to hear your experience. 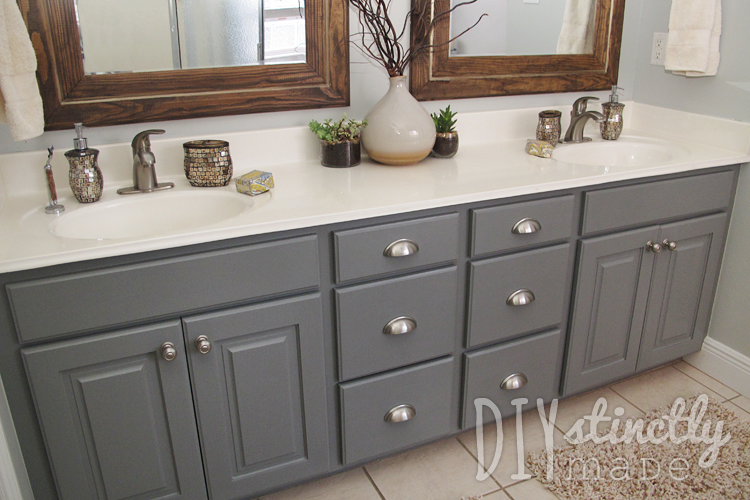 Thanks for posting the step by step on painting your bathroom cabinets. 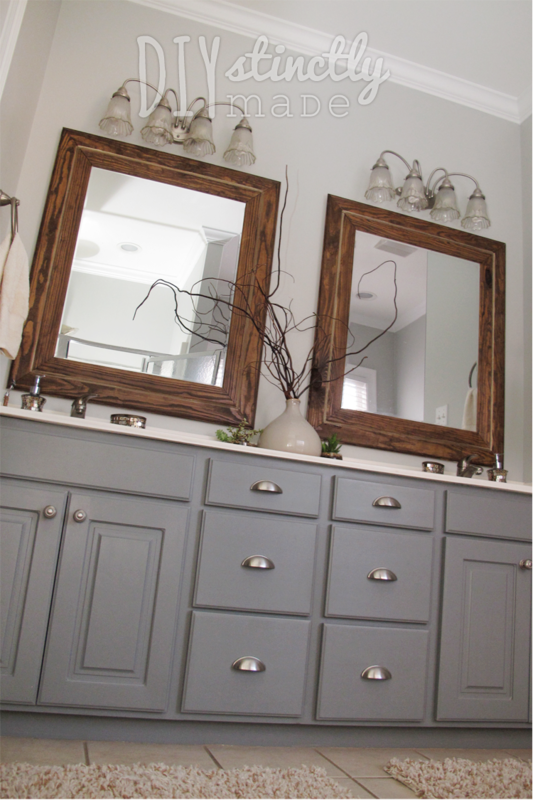 Curious about what color of paint did you use on the cabinets? Is the paint a latex paint? Yes, we used a latex paint. After several months of wear and tear, we did have some chipping occur. I think a rougher sand of the cabinets along with a primer base coat would have helped with this. Very inspiring! I just might take on my bathrooms myself! Is the vanity top solid white? Yes! It was a standard builder grade white cultured marble. Hello, I’m not sure if you are still checking here for questions, but I would love to know where you got your mirrors? We made them!!! Found some cheap plain mirrors and framed them in with tongue and groove. Beautiful! Since I have you here I have another question. We are looking into replacing our bathroom floor. They’re telling me if I want to replace the vanity I should do that before the flooring. We Really can’t see spending that money right now. How do u decide if you should spend the money on something or just use what you have? The vanity is builders grade but I’ve already painted and added new hardware and I think it looks nice. The top is boring but fine. Any advice? Tx!